Take an in-depth look at the symbols, language, geography, art, and traditions of Italy—at a savings of 25%—with the books, activities, and poster in the Exploring the Culture of Italy Bundle. Snapshots of Italy introduces the location, national flag, cultural symbols, and landmarks of Italy, along with common phrases in Italian. 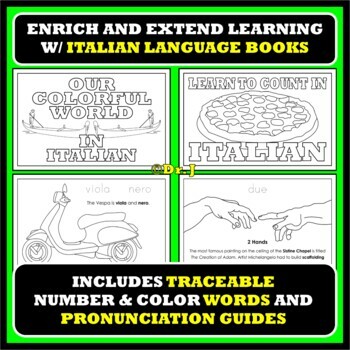 Introduce the official language with Learn to Count in Italian, a book that features fun facts, traceable number words, and two activity pages. Follow-up with Our Colorful World in Italian, a mini coloring book that includes a color chart. How to Make a Pizza is a cut-and-glue sequencing activity. The Legend of Romulus and Remus is a fill-in-the-blank story about the founding of Rome. Mapping Italy challenges students to use critical thinking skills as they complete a crossword puzzle based on a map of Italy. Italian Pasta highlights eight different types of pasta. 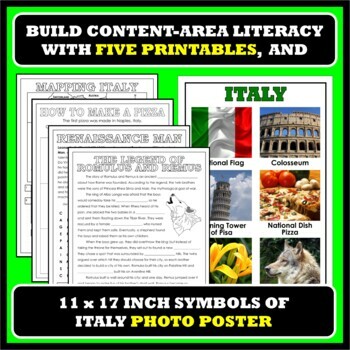 Symbols of Italy is an 11 x 17 inch poster that illustrates six cultural symbols with colorful photographs. Tastes of Italy features six iconic Italian foods. Sample Pages: Please see the preview for sample pages from the bundle. To view additional images, click on the individual titles listed below. NOTE: The activities are only available in the two bundle packs. Technical Info: The resources are in PDF format, combined into a single zip file, and illustrated with original, high-resolution images and/or photographs. Visit My Store: Click here to see all of the Let’s Get Real topics and resources. Look for the category list on the left side of the home page. Facebook: Click here to follow me on the Let’s Get Real Facebook page for weekly posts about teaching strategies and resources. Pinterest: Click here to check out the Let’s Get Real Pinterest boards for more ways to enrich your teaching themes. What kinds of resources does Let’s Get Real offer? Let’s Get Real take-home books and learning center resources focus on content-area literacy, that is, helping children gain the specialized science and social studies vocabulary that enables them to excel in reading fluency and comprehension. In addition, all Let’s Get Real resources are illustrated with realistic, original images and/or photographs. How can I see what you offer or know when you’ve added new materials? Click on the star to the right of this description (under my pic) OR click on my store link (above), then click on the star at the top of the page to follow Let’s Get Real. You’ll be the first to know about new materials, sales, and freebies. To view the resources by science/social studies topics, look to the left on the store page, under the heading Custom Categories. What are TPT credits and how do I get them? Every time you provide feedback for a purchase, TPT gives you 1 credit for each dollar you’ve spent. After you’ve used (and hopefully loved!) a resource, hover on your picture at the top of the page and open the “My Account” tab. Click on your “My Purchases” category. You should see a list of your purchases with a “Provide Feedback” button for each one. Just click the button and you’ll be taken to a page where you can rate the product and leave a comment for me. You can apply the credits you earn to any future purchases and I always appreciate your positive feedback. What do I do if I have a question about or problem with a resource? You can always contact me through the product Q & A tab, located at the bottom of the product description. Please “share the love” by telling others how much you like Let’s Get Real products; but please don’t share the copyright. Each Let’s Get Real resource—including graphics and illustrations—is copyrighted by Dr. J/Teaching Texas LLC and may not be redistributed, sold, or placed on the internet. This resource is for one teacher-use only. Thank you so much for your support!